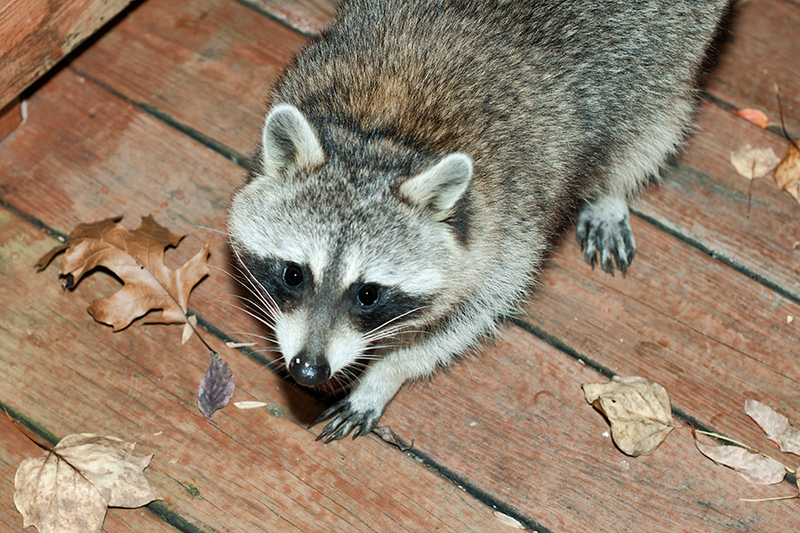 The raccoon's scientific name, Procyon lotor, means "washer dog" although it is a closer relative to the bear family. Raccoons are incredibly smart. On the mammal IQ scale, they rank just below the primates, higher than most domestic animals such as cats and dogs. That is probably why this fluffy fellow have almost no fear of men. Of course, it will run away when you get too close, but compare to other backyard animals raccoons are the most impudent for sure. They are also amazingly adaptable and contrary to popular belief have benefited more from the presence of humans than not. Apparently, there are many perks in our backyard. I'm sorry, but I need this peanut! Raccoons have a highly sensitive sense of touch; this tactile experience gives the raccoon a better sense of what it will be eating as if they "see" with their hands, which are so amazingly nimble. With their subtle fingers, raccoons can unlace a shoe, unlatch a cage and deftly retrieve coins as thin as dimes from your shirt pocket. They use their paws to open trashcans, open doors, and pick up their food and eat it in same way humans do. It was a Halloween season when my husband and I decided to have a little fun with our new guest and so the skeleton cat come in handy. I finally have found you, my love! How did Founding Fathers celebrate 4th of July? How many 4th of July fireworks explode each year? The trues and myths of the Independence Day. Cookouts, fireworks, and, of course, a chance to wish Uncle Sam a big "happy birthday"—the 4th of July means summer in full swing across the United States and beyond. Such 4th of July festivities are as old as the United States itself. How to Train Your Dragon.... or Chipmunk! So, how DO you train a chipmunk? With the right chipmunk, it is simple. Really! Just follow these steps and tips! Friday the 13th: 13 reasons to be superstitious on this day. Today is Friday the 13th and many people are being nervous around black cats; afraid of walking under ladders, breaking mirrors, spilling salt, opening umbrella indoors, and anxiously watching the skies for sudden lightning strikes! Where did our superstitions surrounding this day, known as paraskevidekatriaphobia, came from? Along with why is there such apprehension surrounding the number 13? Christmas wasn't an official holiday in America until 1870. The holiday might seem like an ancient tradition steeped in history, but it's much younger than you might think. Christmas didn't became an official federal holiday until June 26, 1870. The holiday mostly got its start in Pagan roots as an excuse for drunken revelry, which wasn't appealing to the strict Christian Puritans. Early in America's birth, some states started recognizing Christmas and a lobby started for a national holiday for Thanksgiving and Christmas to strengthen the nation's unity. Skippers differ from the true butterflies in their proportionately larger bodies, smaller wings, and hooked antennae, among many other structural differences, and can be confused with the moths. These smallish butterflies earns their common Skippers name for their jerky, skipping flight as they wing their erratic way from flower to flower. I am not going to tell you a big story this time. Instead, I would like to show you the wild life you can find outside after spending only two hours. The amazingly different behavior of animals and birds. You will see a lot, if you just stop and look around and notice something naturally beautiful each day. I am certain you would have a lot different life.